Thread: :) look what I made for Noah, Brooklyn. I love them Are you going to sell them? I bet you could make those Tan! I have been looking into getting some of these, too, but a teacher friend cautioned me about it. A lot of people are not using food-safe fabrics and some break down after washing. My friend teaches high school and she was going to have her grade 12 leadership class investigate and research what material would be appropriate for use with food. They were then going to make some as a fundraiser for a school they are building in Africa. I must email her and see what she found out. I, too, Tan, would like to cut down on lunchtime waste! what kind of fabric did you use for the lining? have you tried washing them a few times in the washing machine?? Most of the bags seem to use 100% Polyester with Water Resistant Polyurethane Laminate Coating. I'm not sure where you'd buy that. Is this like instead of ziplock bags? On further research I'm finding that PUL as it's called supposedly isn't food safe? Not sure why it's been used in absolutely everyone's bags. . .anyway there is some debate online. 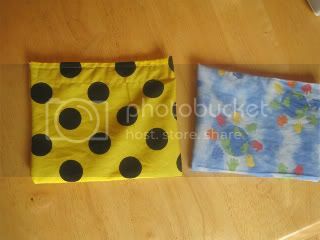 The fabric is the kind you would use for bib backing, windbreaker jackets ect. I think it may be the same kind as what they are selling. I bought some off Etsy last summer for DD1. I think I bought about 8? 4 large and 4 small. I've never had to use a ziplock bag for her lunch. LOVE them. Use them for anything that's dry - sandwiches, crackers, rasins, etc. And they will also keep cut up fruit, strawberries, oranges, apples until lunch time. If cut up fruit is in there all day the outside of the bag is a bit damp. I don't put mine in the washing machine, did once and the velcro ruined a few things sticking to it. I wash em with the regular dishes and dry em overnight on the dish rack. Those are such a great idea! I'll definitely be making some of those once my kids are school age! I have bought a bunch called RUME from goneshopping.ca. They are FANTASTIC and wash great and are made of food safe material. They cost a bit (3 for about $15) but they come in different sizes and prints and last very well. I think I've seen them at Chapters sometimes too. Noah is STILL sick- Update- Took Noah in again.